Due to manufacturer's restrictions we are unable to ship Hoka One One products to Great Britain. Riders from all corners of the globe have been receiving HOKA ONE ONE cushioning for six years. Today, the TOR SUMMIT MID WP finally brings this characteristic to hikers. The EVA and RMAT® material of the midsole provides unparalleled comfort under the foot and the geometry of the curved sole profile underneath the metas ensures a smooth stride. The technical geometry in the middle of the foot aims to improve the stability under the foot on the rugged terrain. Finally, the rubber of the Vibram® Mega-Grip outsole with its 5 mm studs offers a very good adhesion and an optimal longevity. "Excellent product based on past experience"
"Wow these are soooo comfy !!" A groundbreaking blend of running shoe cushioning and supportive trekking uppers come to play in the TOR ULTRA HI WP to create a category-defining outdoor boot. The upper is made from full-grain leather for durability and support, with a moulded upper collar for flexibility and comfort. 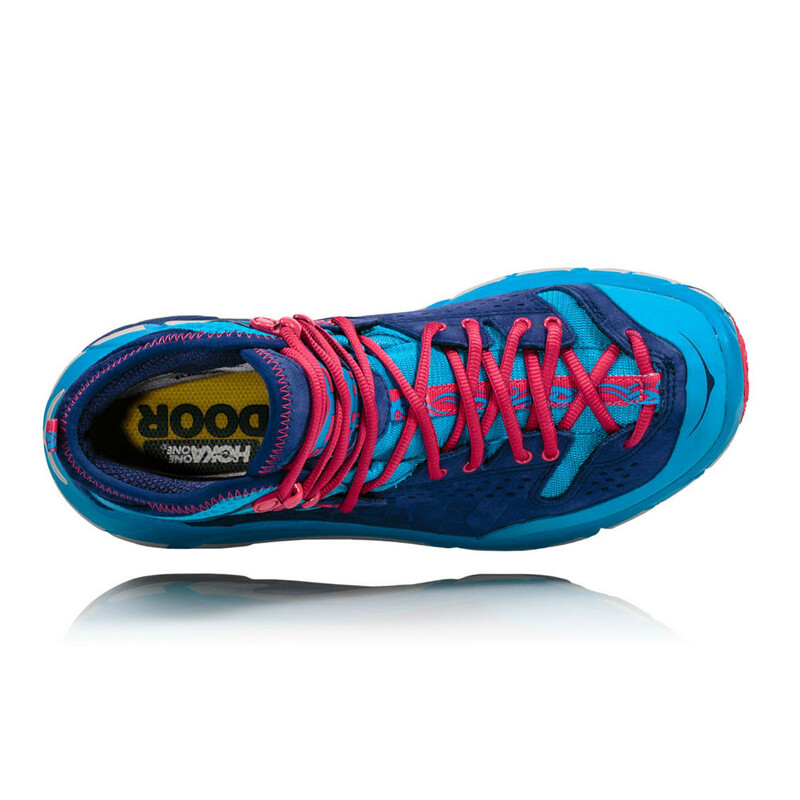 To add to this, the boot features Event waterproof membrane with full bootie construction for a water tight fit, that keeps the internal environment dry and comfortable. The combination of leather and tough nylon mesh provides support around the foot and ankle, and allows air to permeate the interior for a cool and collected feel. Coinciding with these features, forefoot flex grooves are embedded to fold on impact for control and comfort and a protective rubber toe cap which is merged to reduce wear and tear from on coming rocks and roots. The Meta-Rocker midsole geometry of the TOR ULTRA HI WP is specifically engineered with a low heel-toe differential and a sculpted outsole radius in the heel and toe. This encourages a unique natural rolling motion, supports natural form and encourages an efficient, continuous positive rolling motion from heel-strike to toe-off. Unified with the meta-rocker, a uniquely engineered Active Foot Frame midsole geometry allows the foot to sink deeply into the shoe's midsole. 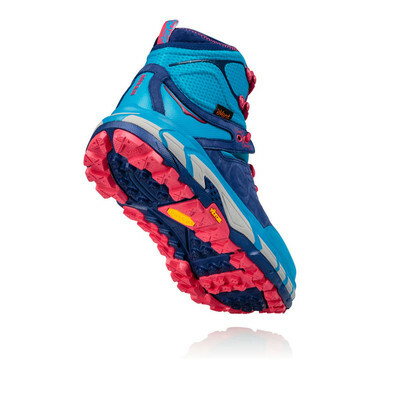 This Benefit's integrated stability which is adaptable to a wide range of feet and running styles. With this midsole support 50% More Cushioning is asserted. The Engineered midsole volume is up to 2.5X the volume than standard running shoes, made with performance-specific cushioning material for excellent shock absorption and an inherently stable ride. 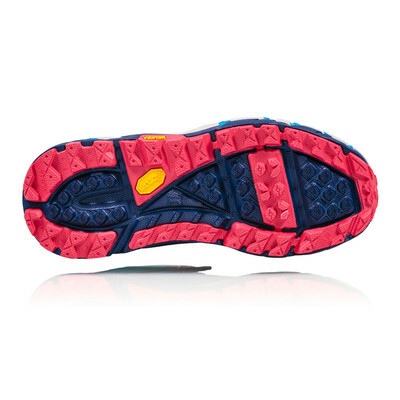 Vibram MegaGrip outsole rubber on Hoka One One's proven midsole blend of EVA and RMAT material provides both traction and cushioning. The outsole features a full ground contact design, flex grooves for improved stability and 5mm Vibram Megagrip lugs for superior floor fighting grip. The K-Shape outsole geometry provides dynamic guidance through a strong interior wall. 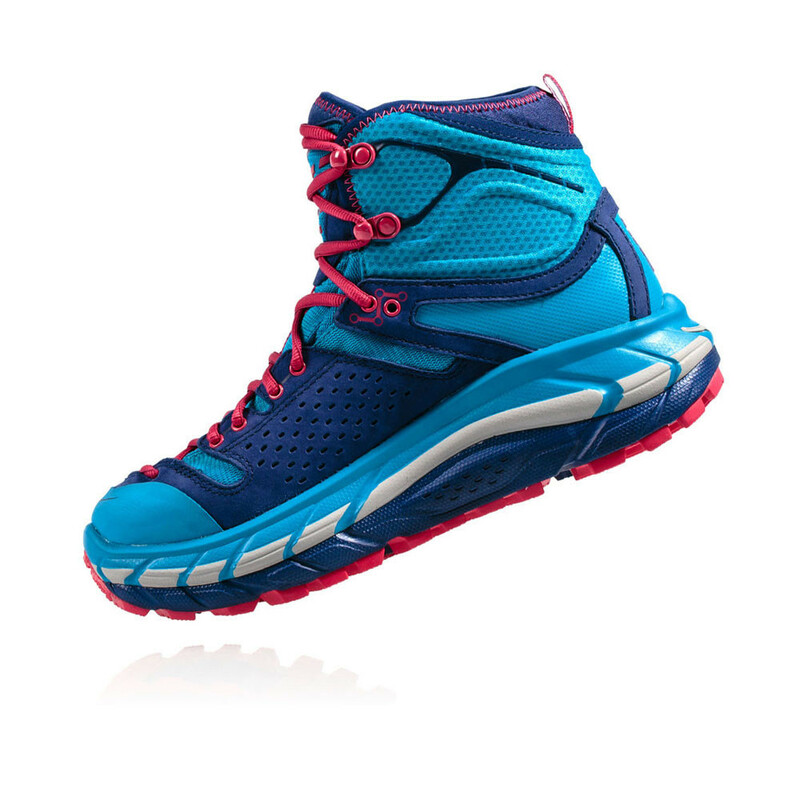 Hoka One One is the brainchild of two gravity sports enthusiasts Jean-Luc Diard and Nicolas Mermoud. Both men have been adventuring for as long as they can remember, and their trail running experiences have taken them across the globe. Both Jean-Luc and Nicolas are committed to the values of freedom and enjoyment and feel that this is part of to the running experience whether running on the trail or in the city. With this in mind they started to look at the variables that affected the performance of different types of runners. They quickly came to an important conclusion; fatigue, impacts and muscle strains were challenges that runners of all stripes had to deal with every day. So Jean-Luc and Nicolas came up with a brilliant idea, why not design a shoe that would help to alleviate these problems - so that freedom and enjoyment could be guaranteed every time you go running! 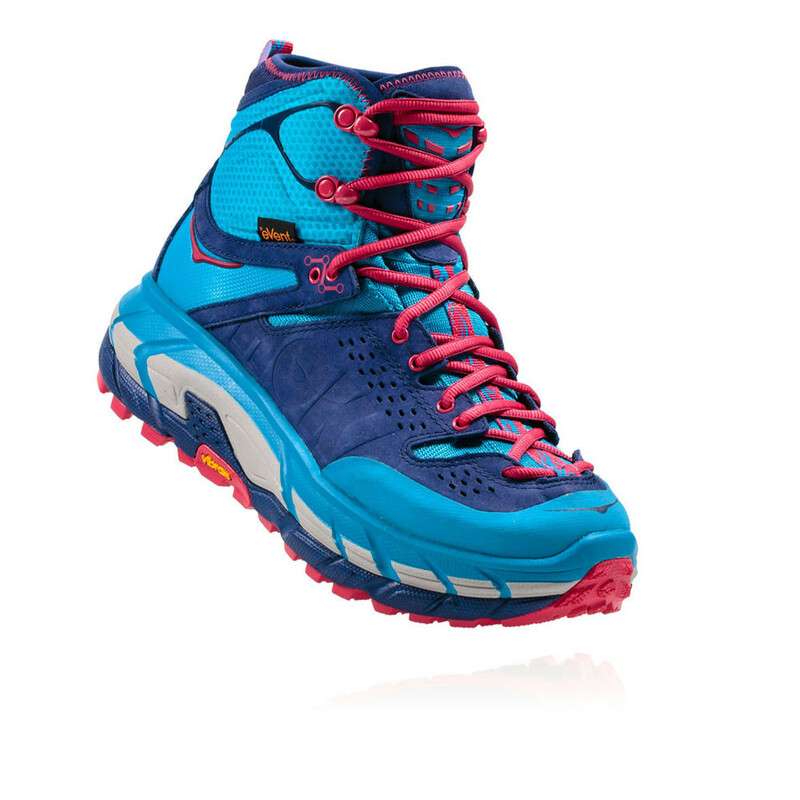 From that idea Hoka One One was born. 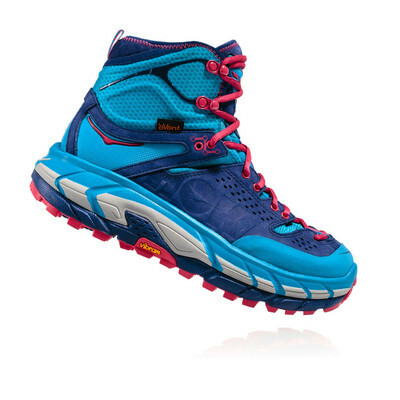 The word Hoka is derived from the ancient Maori language and roughly translated to "now it is time to fly". That's just how it feels to run in a pair of Hoka One One shoes; with each and every step, your foot flies. Today's runners from around the world are learning about the benefits of Hoka One One, they have been used by marathon winners. 50 miles, 100 miles and even 2000+ miles ultra-runners as well as runners just like you or I, who want to enjoy running, perform at their peak and feel that important sense of freedom whilst maintaining top physical performance and protecting against shocks, jolts and injuries. So put your best foot forward, it's time to fly! Full Grain Leather and Textile Upper - For Durability and support. Event Membrane with Full Bootie Construction - Waterproof sealing. Molded Upper Collar - For Flexibility and Comfort. Lace-to-toe with Forefoot Flex Grooves - For Control and Comfort. Protective Rubber Toecap - To reduce wear and tear. Late Stage Meta-Rocker Geometry - Encourages a unique natural rolling motion and supports natural form. Active Foot Frame Geometry - Provides integrated stability which is adaptable to a wide range of feet and running styles. Full Length EVA Top Midsole - For underfoot Cushioning. Engineered RMAT Midsole - For a Supportive Ride. Vibram MegaGrip Hi-Traction Outsole with 5mm Lugs - Provides optimal grip and control.